The Viking heritage of York is revealed in many of city's place names, Goodramgate, founded by the Vikings in 1100 is one example. Once referred to as Guthrumgate or Gutherumgate, possibly in honour of Guthrum, a Viking king of York who converted to Christianity and reigned in the ninth century, the street connects the former east and the north Roman gateways, now King's Square and medieval Monk Bar, the tallest and most elaborate of the four gatehouses at York, which now houses the Richard III Experience. Today Goodramgate is home to a variety of shops, pubs, restaurants, tea rooms, choclatiers, jewellers and York's largest collection of charity shops. Goodramgate contains an interesting and eclectic mix of architecture, Our Lady's Row (pictured left) is the oldest row of houses in the city. The timber-framed cottages date from 1316 and are one of the earliest examples in England of the medieval jettied houses, where the upper story extends outwards above the lower. They were built to endow a chantry dedicated to the Virgin Mary. 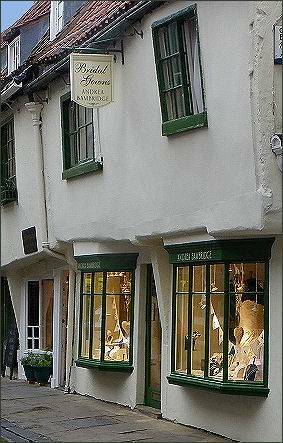 The row originally consisted of possibly eleven small dwellings which was later reduced to eight. The houses are very simple, made of plastered timber framing with roofs of curved pantiles. The original row was 128 feet long and only 18 feet deep, and had two storeys and eleven bays. 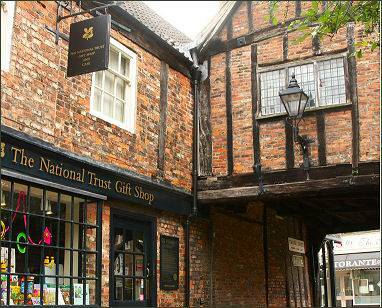 The houses were built for the poor of York and mostly just one ground floor room, and one first floor room. The houses were built for Holy Trinity Church, a characterful Grade I listed building and one of York's hidden treasures, which is situated behind them in a secluded setting. Described by the poet laureate Sir John Betjeman in his Guide to English Churches as ' a delightful medley of different materials, colours and textures, many due to parsimonious repairs in the past'. The characterful building dates from between 1250 and the late fifteenth century but retains some features from its twelfth century foundation. The church contains an inner chapel; this was once isolated from the main body of the building and allowed lepers to take part in services via a squint hole in the wall. Part of the Chancel dates back to the twelfth century; the Tower and North Aisle were added in the early fifteenth century. The church is reached through an eighteenth century archway. An inner chapel was used by lepers and has a squint hole in the wall. The box pews date from the seventeenth century, the building has no gas, electricity or running water and is now in the care of the Churches Conservation Trust. 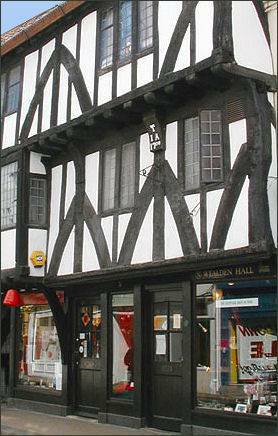 Wealden Hall, 49 & 51 Goodramgate (pictured right) forms part of a sixteenth Century, Grade I listed building is a rare northern example of a medieval building type more usually found in the south of England. Goodramgate boasts a number of old historic pubs. 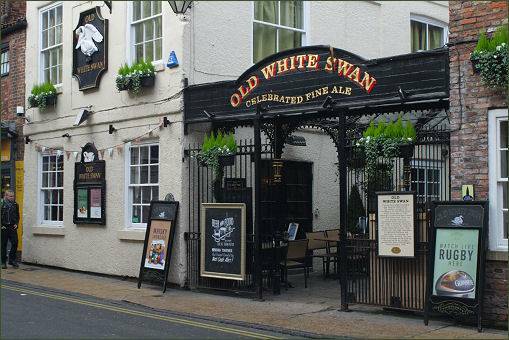 The Old White Swan, which is claimed to be haunted, dates from the sixteenth century and has medieval buildings behind its courtyard. Court proceedings, including bankruptcy hearings were once held there. In 1781, Mr O'Brian, said to be the world's tallest man,was exhibited at the pub. O'Brian stood 8 feet tall and the then landlord charged onlookers a shilling to see him. Good quality food is served at the pub. The galleried Snickleway Inn and the Royal Oak (pictured left) near Monk Bar both date back to the fifteenth century galleried inn while The Cross Keys dates from the late nineteenth century. 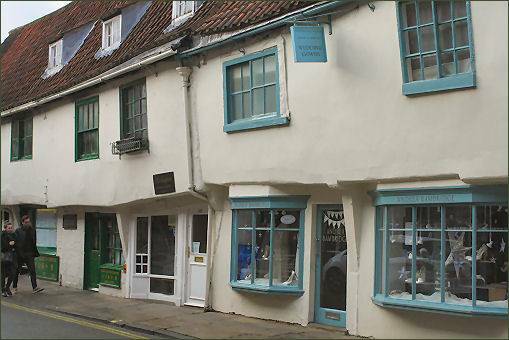 Bedern Passage, a Snickelway between Goodramgate's shops, leads to Bedern Lane and the remains of Bedern Chapel which was consecrated in 1349 as the Chapel of the College of the Vicars Choral of York Minster. The chapel was the centre of a large monastic-like complex where the medieval vicars lived and worked. The Bedern Hall is the other main survivor from this establishment, it is a large fourteenth century meeting hall and refectory. The name Bedern is first mentioned in around the year 1270 in documents relating to the college, although the word is Anglo Saxon meaning ‘house of prayer’. A similar name was given to other Yorkshire colleges in Ripon and Beverley. Ogleforth and Aldwark passages lead to the Merchant Taylor's Hall, which was built by the Fraternity of St John the Baptist (an organisation connected to the Taylors' Guild) in the fourteenth century.